7 Meals for $75.00 for our family of eight. 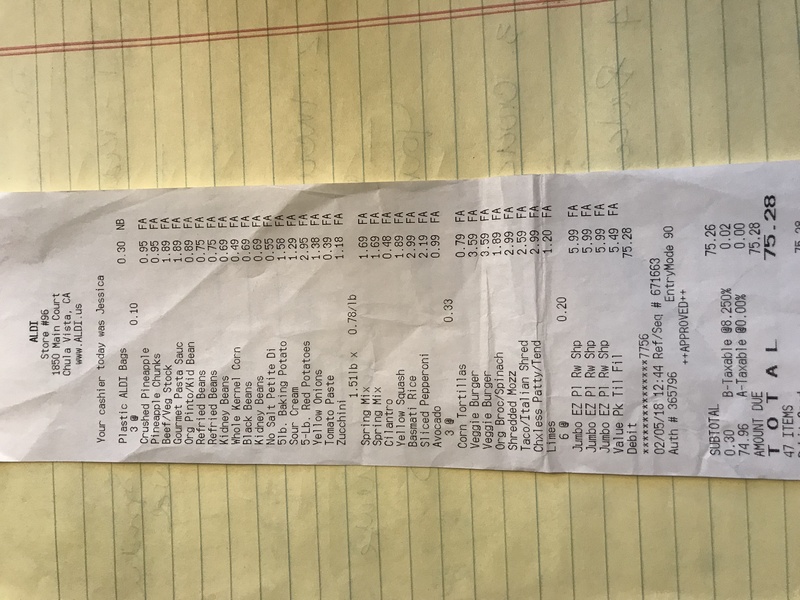 In one of the FIRE groups I am in (if you don’t know what FIRE means – it stands for Financial Independence/Retire Early and it really is “a thing.”) everyone was RAVING about this store called ALDI for really great prices on groceries. Always looking to tame my grocery budget, I’m like, “what’s an ALDI and where do I get one?” I learned they are mostly on the East Coast. Extreme Sadness. To maximize our grocery budget, I generally have a plan of action. Loosely it is this. 2 large shopping hauls a month and maybe one small one a week if we forgot something or produce has gone bad. On the big shopping days, I hit four stores, typically in this order. The 99 Cent Store, Costco, then Sprouts for produce and lastly Walmart for whatever else I could not get at the other store and because they (usually) have the best prices on household goods like laundry soap, deodorant, dryer sheets…etc. The stores are all within a few miles of each other, so even though it is a pain to get in and out of my car 4 times, the savings I get by doing it this way saves us hundreds throughout the year. Well, to my surprise I did a search on the interwebs for ALDI and was pleased as a peach to learn one was opening 5 miles away! SCORE! My daughter and I were so excited to go try it out. For those who don’t know about ALDI, it is a very “bare-bones” store; it will not have everything you need – but it will have most of it. There will not be name brands, but off brands, but still excellent quality. You will need a quarter to release your shopping cart from the other shopping carts (but don’t fret – you will get it back) and you will also need to bag your own groceries at a counter adjacent to the cash registers. Tip: Don’t try to take the cart sitting there with the cashier without giving her an empty. She might not like that very much. (You’ll understand when you go there.) I am happy to report, it really was worth all the hype! They have an excellent selection. The only thing that it was lacking was vegan options. It had a few, but not a whole lot. Over-all two thumbs up! 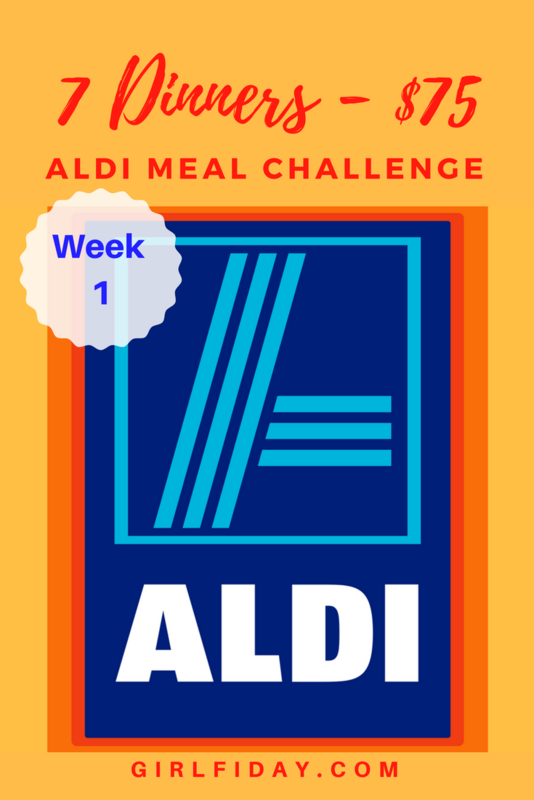 After finding Grocery Heaven (I “heard” that’s what ALDI’s goes by) – I stumbled upon several Pinterest ALDI food challenges. I am ALWAYS down for a challenge. But even more, I am ALWAYS down to see how I can trim this food budget for our family of 8! All of the challenges were for smaller families. So, I am here to fill that void. I know many of you have large families like us and are always looking for ways to optimize your budget. SO….the next four weeks I will be posting our challenge. My daughter and I will be creating a seven day/seven dinner meal-plan for our family of eight for under $75.00. DISCLAIMER: I am going to rat on myself here….initially, this was going to be a $50.00 challenge; however, that proved really difficult – especially for a family of eight. But also, we do not eat meat – only seafood and shellfish which is, by far, more expensive by the pound then chicken, pork or beef. HOWEVER, I will be attempting to get it as far under as I can. I am also confident that if your family is smaller than ours and you either eat meat or use 100% vegan protein alternatives, you should be able to get this to around $50.00. DAY TWO: Grilled tilapia, with roasted red potatoes and yellow/green squash. DAY SIX: Veggie Burgers with green salad. Also, if you have a well-stocked pantry (see what I suggest here) many of the items on this receipt are unnecessary. Empty your left-overs into the crock pot. (If you don’t think something would be appetizing in your soup – just leave it out – easy peasy). If you have meat, chop it up into bite sized pieces and put them in. Then add a few canned, dry or frozen goods to it (you should already have these in your pantry/fridge…still don’t know what I mean? – Well, here it is again.) I usually add a can or two of diced tomatoes, maybe some vegetable broth, corn and/or beans, frozen mixed veggies….just be creative. Then several spices. If you are going to add dry noodles, add them during the last 30 minutes., otherwise they will get super soggy. For rice, I typically will cook the rice separately and simply serve the stew over rice. That way it does not get over done. So, even though, adding ALDI into the mix will mean a trip to a fifth store on shopping days, I am hoping to see an even bigger dent in my grocery budget. More savings means more money invested, which all means Momma gets her beach house sooner! I look forward to updating out challenge next week! See you there. We have called it that forever! I kicked around the idea of switching the name to “refrigerator stew” but I got vetoed by Hubbs and the kids. All sound like interesting meals 🙂 I like the personal pizzas idea:) we don’t have Aldi’s in Northern Ireland but I’m guessing it’s similar for Lidl. I have heard that it is similar to Lidl! Personal pizzas is a life saver for us sometimes. Especially when Momma has had a really long day. Love Aldi! I’m sure you have seen me talk about it all the time! I also write about it too. I’ll do a challenge like this for my family of 5 soon. I also shopped at Lidl we have 2 in our area now which is starting to expand the headquarters are in Virginia. Do you have Hmart? Or Korean or Hispanic grocery stores? I’m so curious about the cost comparison. I might have to do a post on that for my area. What are the 5 stores you have to go to each week? I end up at Aldi most of the time and occasion Giant food. I love Trader Joe’s and Mom’s market but they are far and cost more so maybe every other month. I haven’t been to Costco in months! We just got Aldi…haven’t seen Lifl yet. Have never heard of any of the others….we have tons of Hispanic groceries – but I haven’t tried them here in CA yet. We shopped a couple in AZ. Right now I shop the 99 cent store for bread ($1 a loaf for good bread – not the cheap stuff) and tostada shells and sometimes canned goods and produce depending on what they have. Then I go to Costco for the large bulk items, mostly snacks for the boys, paper plates, TP and paper towels and fish. Then I hit Sprouts for the produce – by far the lowest prices here. Last stop is Walmart for most everything else. Now with Aldi, we will go there before Costco. Costco does not have the best prices on everything and I try to be very conscious of the price per unit. Hi, Wendy! I’ve read your posts in the ChooseFI FB group and am so happy to see your blog! Great work! Thank you for taking the time to read it! I hope you enjoy it.